Managed by the University of Georgia's Warnell School of Forestry and Natural Resources, Oconee Forest Park includes Lake Herrick, foot and bike trails, picnic tables, and open, grassy areas bordered by native plants and wildflowers. The towering 100-year-old trees are the remnants of a once extensive old-growth forest that stretched across the bypass toward the UGA Golf Course. Today, the park is the School's gift to the University community. Forestry faculty once used the forest for research. During the Depression, the land served as a "side camp" for the Civilian Conservation Corps whose members worked in the tree seedling nursery on land now covered by Lake Herrick. 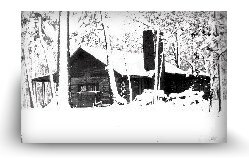 Officially established in 1982, Oconee Forest Park was the vision of a few far-sighted professors who began in the late 60's to look for a way to set aside the remaining old forest for future generations. Dr. Bill Moss, professor of forest recreation, and the late Dean Emeritus Leon Hargreaves understood decades ago that as campus grew, so would the need for such a place. When Moss left UGA in 1970, Dr. Walter Cook took up the cause. He wrote up the proposal, designed the trails and patiently saw the project through years of planning and revisions. Today more than 50,000 people a year, among them many "regulars" come here to relax, exercise, fish or picnic with friends and colleagues. The park also provides a convenient living laboratory for faculty who teach botany, ecology, dendrology and horticulture. The park manager, who along with student interns maintains the park, has labeled many individual specimens for this purpose. 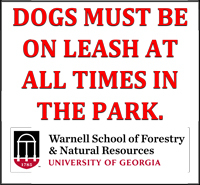 As East Campus marches out College Station Road, Oconee Forest Park may well prove to be UGA's Central Park, an island of green amid the buildings, buses and bustle of campus. "The park provides an important sanctuary for University students, staff and faculty as well as those in the Athens/Clarke community," Says former Dean Arnett Mace Jr. "It's crucial that as the University grows, we retain this park for its aesthetic and recreational values and as a natural resources teaching laboratory."